Inside every person is an aspiring, talented cook. 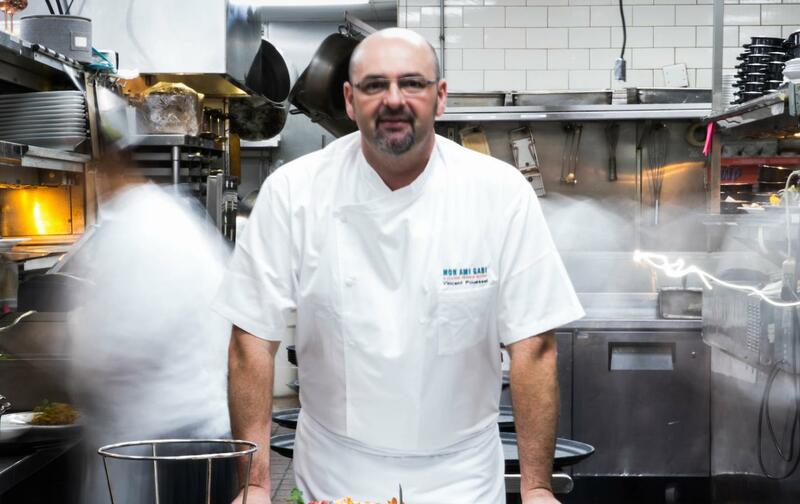 That is the inspiration behind Mon Ami Gabi Las Vegas’ food education events, led by Executive Chef Vincent Pouessel. Just in time for holiday party season, his Holiday Hors d’oeuvres 101 Chef Demo Series invites guests of all culinary experience to learn how to make some of his favorite holiday appetizers. Surrounded by shoreline, seafood and savory crepes, Chef Vincent grew up in a French household where someone was always cooking. That upbringing sparked his passion for teaching others how to bring out their inner chef. This holiday season, Mon Ami Gabi invites you into our kitchen to learn how to make a few of Chef Vincent’s favorite holiday hors d’oeurves at home. Chef is hosting Thursday demo sessions on December 6 and 13 and Saturday demo sessions on December 1 and December 8. If you can’t make it to any of the Mon Ami Gabi classes, Chef Vincent shares three things to keep in mind as you are planning your holiday appetizer spread. Garlic Butter Escargot Puffs are a great, French-inspired app that is easier to make than one might think, plus majority of your prep can be done ahead of time which means more time spent sipping vino with your guests. Sauté, season and chill the burgundy snails, then bring them out closer to party time to fold and bake into pre-sliced pastry puffs. This dish boasts a flaky, buttery flavor similar to the Wild Escargots de Bourgogne you can find on Mon Ami Gabi’s menu. 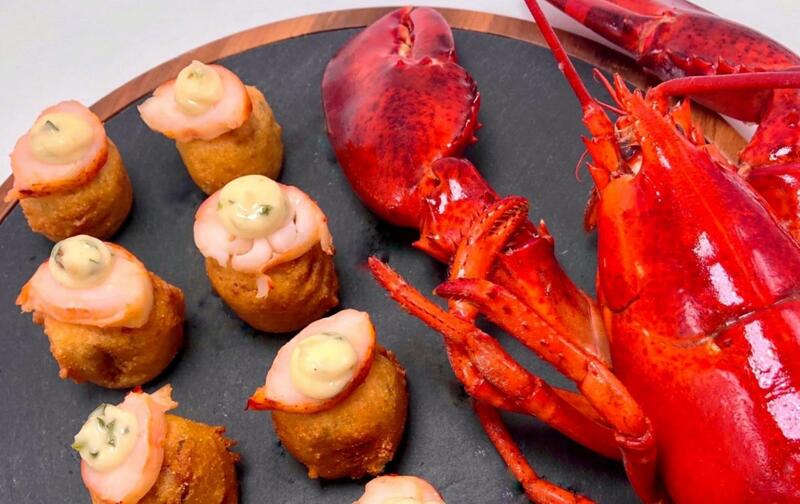 The Mini Lobster Corn Dogs take a nostalgic favorite and up the ante by using fresh-caught seafood to elevate the flavor. This one blends lobster and scallops and combines them with Asian chili powder and other seasonings. Chef Vincent says that one of the most important things is to pay attention to where your ingredients are coming from; great fresh ingredients (especially seafood) make for a great dish. In addition to incredible taste, looking at your dish as “presentable art” will ensure your guests will go for it, not to mention, bacon on anything is A OK in our book. 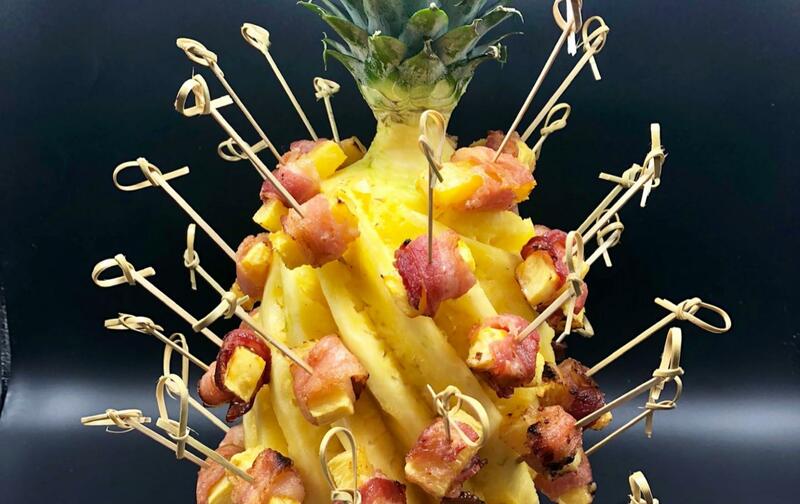 The Bacon Wrapped Pineapple Bites are a great appetizer that guests can eat with their hands so they won’t fumble with silverware or have to balance holding a plate while trying to drink their martini. For this recipe, Chef Vincent teaches a classic technique of carving pineapple, which is used as a base for serving up these sweet and savory skewers. If you are hosting this holiday season, a few other things to keep in mind. 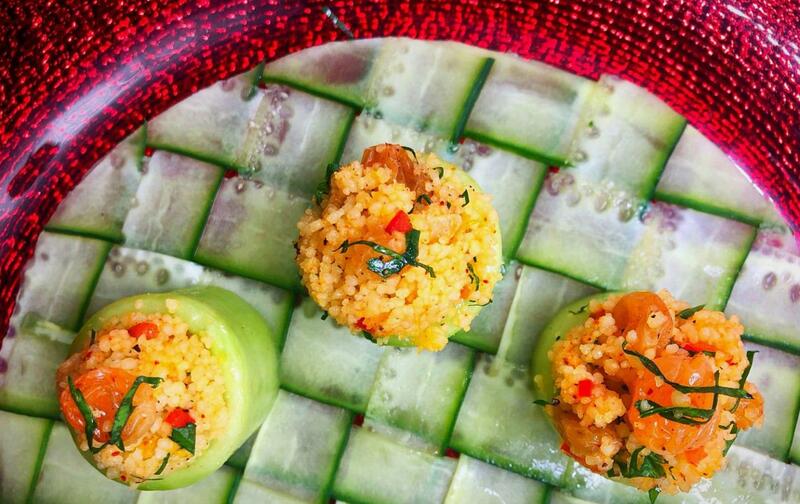 Everyone has different likes, dislikes and allergies so always try to serve at least one vegetarian/vegan-friendly option like the Raisin Couscous Stuffed Cucumber Cups. Mon Ami Gabi not only makes its interactive chef events personal by spotlighting dishes that reflect Chef Vincent’s memories of Paris, but also makes the difficult seem doable. Sign up for Mon Ami Gabi’s December Holiday Hors d’oeuvres Chef Demos here. Join us at Mon Ami Gabi Las Vegas, click here to make your next reservation. Looking for New Year’s Eve plans in Las Vegas? Secure your spot at this year’s pre-fixe dinner at Mon Ami. Rinse snails under cold water and drain. Warm oil in sauté pan. Lightly sauté bay leaves, thyme and garlic. Add snails and salt and pepper to pan. Cook for 5 minutes. This is so herbs and garlic have time to enhance the snails. Refrigerate snails and save for later. Cut the puff pastry sheet into 36 3-inch discs. Place in the center of each puff pastry disc 1 tablespoon garlic butter, and top with 1 piece of escargot. Thoroughly beat egg to create egg wash. Brush the perimeter of each puff pastry with egg wash. Close the puff around the escargot, making a little purse (dumpling). Place escargot puffs on sheet pan lined with parchment paper, sealed side down. Brush with egg wash, and sprinkle a pinch of sea salt on each. Allow to rest in the refrigerator for 15 minutes. Cook in a 375°F oven for 8 minutes. Serve warm on a platter with a bamboo pick or skewer. Combine all ingredients; process through food processor. In a food processor, blend scallops until fully puréed and add 3 eggs. On low speed, gradually add the heavy cream to purée mixture, making sure mixture stays nice and smooth. Season with salt, pepper and Togarashi. Should be smooth and silky mixture. Place mixture in mixing bowl and fold in chives and tarragon, lemon zest. Fold in chopped lobster meat with a spatula, making sure well combined. Place mixture in a pastry bag and cover cutting board with saran wrap. Pipe a line about 8 inches long by 1½ inches wide of meat mixture on saran wrap and roll like a sausage. Roll the saran wrap tightly around the “sausage”—approximately 10-12 times—and tie the ends. Bring pot of water to 175°F for 25 minutes. In the meantime, prepare the corn batter (see recipe below). Chill in ice water until fully cold. Cut into 1-inch segments that you will dip in corn batter and fry in a fryer at 370°F for 5 minutes until golden brown. In a mixing bowl, mix all of the dry ingredients together. Gradually add milk with a whisk until smooth. Rest batter in refrigerator for 30 minutes. Peel one pineapple and cut into 1½” x ½” square sticks. Peel the second pineapple, and cut the bottom so it sits stable. Nicely trim the leaves for presentation. On a cutting board, lay the bacon strips into quarters. Wrap each stick of pineapple in the bacon. Place on baking sheet lined with parchment paper in oven for about 7 minutes, until the bacon is crispy. Glaze with Date Glaze while still hot. Place the bacon wrapped pineapple on skewers, and pick them onto the second peeled pineapple. Your bacon wrapped pineapple bits are ready to be served! Soak the dates in the hot water for 10 minutes. Purée in a mixer, and sprinkle with cayenne.